Our 15KW Wood Pellet Heater with Wet Back. The unit is fully automated with desired room temperature and on/off timer. 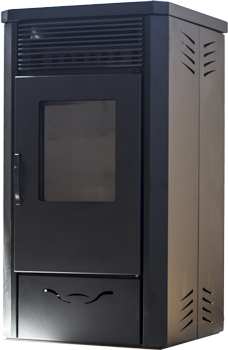 This 15K Wood Pellet Heater has its own ignition so no fire-starter required. The 15KW Wood Pellet Heater is rated to heat up to 120sqm (performance will depend on the quality of the residence’s insulation). Wood Pellet consumption is 0.8 to 2 kg per hour depending on user settings. Attention: The wood pellet heater will only run of 6-8mm wood pellets. Use of any other fuel will void any manufacturer’s warrantee.